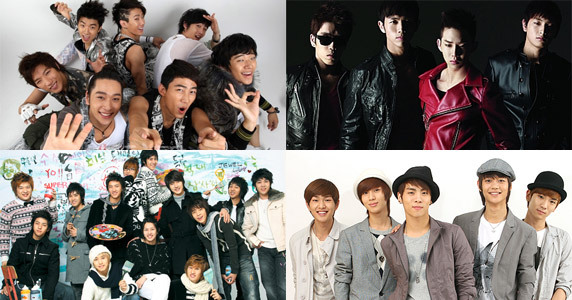 [Music Bank Extravaganza] 2PM + 2AM + Super Junior + SHINee to join forces on Music Bank? And More! Girls' Generation / SNSD's highly anticipated return isn't the only thing stirring up interest on the upcoming mid-year June 26th Music Bank extravaganza. Members from the boy groups 2PM, 2AM, Super Junior, and SHINee will come together as Boys Generation and perform "Gee." So far, the rumored boys will be, From Super Junior: Yesung, Shindong, and Sungmin. From 2PM: Jaebeom, Nichkhun, and Taecyeon. From 2AM: Jo Kwon. No word on which SHINee boys will be included to finish the 9 member lineup. That's not the only big news for this Music Bank extravaganza, SHINee and Girls' Generation will pay homage to former SM Entertainment groups H.O.T. and S.E.S. by performing one of their old songs, while 2PM will do the same performing a song by former JYP Entertainment group G.o.d. Popular rookie group 2NE1 will also do a cover of Rihanna's "Umbrella." Re: [Music Bank Extravaganza] 2PM + 2AM + Super Junior + SHINee to join forces on Music Bank? And More!